Ring a Link is a non-profit making, charitable transport organisation. 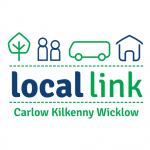 We offer affordable and convenient transport primarily for rural dwellers of counties Carlow, Kilkenny, Tipperary and Wicklow. Our services allow you to travel to or from your local village or town for business, shopping, socialising, healthcare, or to connect with national bus or train services. Many Ring a Link services are demand responsive and door-to-door. This means that when you have booked your trip the service will collect you from your home and take you to a location of your choice within the area of service. Follow the links below to register for these services or to see what services are available to you. See how our service works. Many of our services are demand-responsive, meaning passengers can book trips and be collected directly from their homes. See how these services operate. Full timetables and maps detailing areas of operation are available here on the Ring a Link web site. See what services are available to you. Simply fill out an online form to register for the Ring a Link service. Forms can be downloaded and printed if you would like to register by post. If you have questions about our services or you would like to make a suggestion, there are many ways to get in touch with us.